Seams like I have posted quite a few St Paul photos as of late. There is good reason, it's rare these days that I get over to Minneapolis like I was in the past. Plus, I do know St Paul much better than Minneapolis as I grew up on the St Paul side of the Twin Cities. 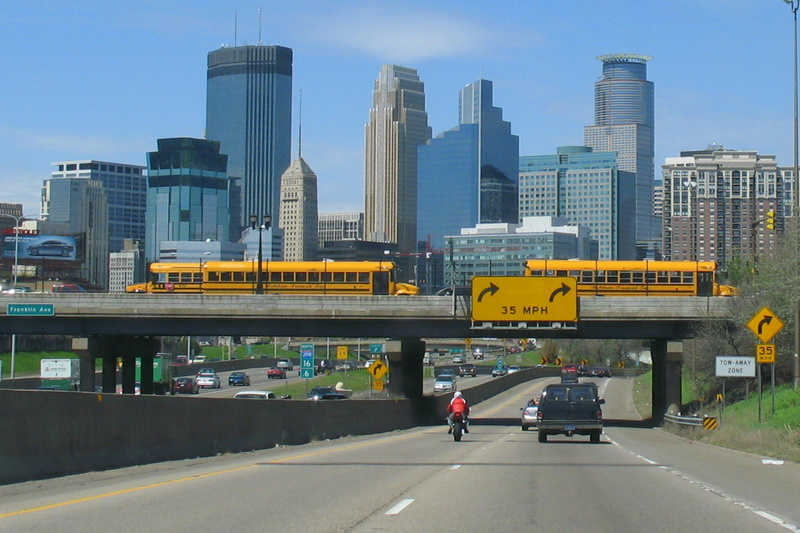 It just so happened last week I made a very brief trip through Minneapolis via the heavily construction zone called Interstate 35W. WOW! I have never seen so much construction happening on 35W in my life. If your heading north, it starts at 494 and continues all the way up to the 35W bridge collapse. There was perhaps, maybe five miles of that stretch of highway that was not under some sort of construction. As for the photo, in all honestly, what I like about the photo is the yellow buses parked on the bridge. It gives the steel and glass downtown some color. I am thankful for: Not having to drive on 35W on a daily basis. I like the dashes of yellow too. Uh, drive safely, okay? Neat photo, we have a 35E and 35W down here. It looks like the bus on the left is coming and going. I really like this shot for a few reasons (1) the school buses are great on there (2) you always seem to have the ability to (and I'm assuming here) take great shots while you drive? Or is someone else driving and you're out the window? Nevermind, you don't have to give your secret away. (3) your horizon line is straight, which I keep striggling with. I think my brain is tipped! Keep bringing us pics of St.Paul, because I'm the opposite of you-I get all my shots in Minneapolis and a rare few in St. Paul, so you help tip the scale St.Paul's direction. Superb shot of the city with the contrast of the yellow buses. Great. I like it, Buses always make for a great photo. I agree with just roaming about the tilt stuff you have done a great job keeping the lines in perspective and I am relieved to hear that I am not the only one having a tilt problem! @ Jim - thanks for pointing out the double direction bus on the left, I completely missed it until I looked to see what you were talking about. Taking the photo, I only saw two buses. @ everyone - thanks for the feedback. It is me taking photos for nearly all the shots from inside the vehicle. If my wife does take a shot from the car as a passenger, I'll give her credit for the shot. There are a lot of poor quality shots for one decent vehicle shot. It is risky, but I only take photos during safe conditions [or at least that's how I see it at the time]. I could be doing something worse, like talking on a cell phone! As for the tilt, they don't all turn out as level as today's photo. It was a shot of luck....well, I have taken a lot of photos from the car.